The Dow Jones is an index of how fast man is destroying the environment. Contrary to popular belief, we do not face a choice between economy and ecology, It is often said that protecting the environment would constrain or even undermine economic growth. In fact, the opposite is true: unless we protect resources and the earth’s natural capital, we shall not be able to sustain economic growth. Here is a way to check yourself out. Are you part of the solution or part of the problem. Are you an environmental pig? Check yourself out. You know that cars cause pollution, so you buy an SUV (Sport Utility Vehicle) which puts out more than double the amount of pollution of a car that would handle your actual needs. You use your SUV to drive to work, even though you could get there faster by public transportation. You support Bush who considers the replacing the combustion engine with a cleaner alternative environmental extremism. You support Al Gore who violated the International Whaling Commission rules and illegally OKed and subsidised the Makah whale sacrifice. You eat at fast food restaurants that produce more bulk in paper than food. To make it worse, you dump the trash on the roadways trusting others to clean up after you. Your heat and hot water are included in the rent. You have hour-long showers, turn up the heat and leave the windows wide open. You consider it your right to kill any animal you choose simply for pleasure, especially when drunk. This even includes endangered species and highly intelligent species such as whales and dolphins. You use medicines such as rhino horn and bear gall bladders. You oppose any cuts to commercial or sports fisheries. So long as there is a single fish left its yours. To hell with saving any for other people, future generations or other species. You oppose any measures forcing companies to reduce their polluting of the waters or air. You have more than two children. You know darn well the planet is overcrowded and the ecology cannot continue to support the exploding population. You don’t care. All you care about is that there are carbon copies of yourself on the dung heap. If you or your wife are infertile, instead of adopting, you use expensive fertility treatments that often result in multiple births. You support churches that oppose all forms of birth control, both in North America and abroad. You know that meat eating puts a heavy strain on the planetary ecology and that it is a very inefficient use of grain. However, you make no attempt at all to reduce the amount of meat in your diet. In making any decisions about fish farming, all you look at is the bottom line for the next year’s profit. You ignore any effects on the ecology. In making any decisions about logging, all you look at in the bottom line for the next year’s profit. You ignore any effects on the ecology in particular the fisheries. You never stop to think when you buy some gadget, What harm will manufacturing and eventual disposal of this thing do to the environment. Is it worth it? You block all efforts of legislators to ensure that all manufactured products are easy to recycle. You vote down all proposals in your municipality on sewage treatment. You buy expensive tropical woods, knowing full well that you are encouraging destruction of the rainforests by doing so. For status reasons you buy wild fur in preference to farmed. You believe man has the right to domesticate any species. You further believe that man has a right to mistreat domestic animals if it is economically convenient. For example, you buy eggs from chickens whose feet are wired to the bottom of their cages rather than spending a few cents extra for free run eggs. You seek out any evidence that you can that global warming is a fraud and repost it wherever you can, even though you have no scientific qualifications to judge the issue. You spend your life trying to convince others that the human population can grow without bound without any serious consequences, even though planet earth is clearly not carrying the load it has now and that there are obvious mathematical limits to growth (ambient energy per person, surface area per person, aggregate biomass). When a new chemical is released into the environment, you insist that the environmentalists prove beyond a shadow of a doubt that it is harmful rather than insisting that those benefiting from the chemical prove it is safe. 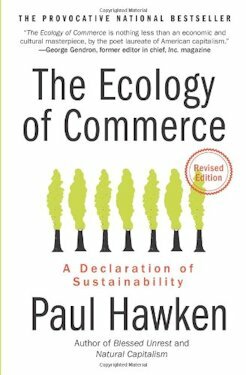 I have not read this book, but Ray Anderson, the world’s greenest executive, credits it with his epiphany that caused him to set Interface (a major carpet manufacturer) on a path to sustainabibly and zero environmental footprint. 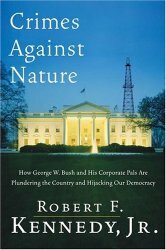 George W. Bush’s environmental record is appalling from tax subsidies for SUVs to reclassifying pig excrement from a water pollutant to harmless land fill. It is no now longer safe to eat fish caught in fresh water anywhere in the USA because of mercury contamination. Bush relaxed the rules on mercury emmissions so none of the coal fired generators will ever have to clean up. You do not have to change: survival is not mandatory. ~ Dr. W. (William) Edwards Deming (1900-10-14 1993-12-20 age:93) On Overcoming Resistance to Change the man who taught quality assurance to the Japanese.